Blizzard’s Hearthstone has defined collectable card games (CCGs) on mobile over the past year, and with the recent launch of the versions for smart phones on both iOS and Android the mobile revenues have rocketed roughly sevenfold. As such it appeals to a lot of self designated “gamers” that find other mobile games somehow below them. 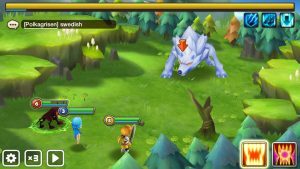 This run down of the game will take apart the main features and discuss how they create and great game, and whether there are larger implications for the mobile F2P industry. There are two main play modes: Ranked and Arena. Ranked can be considered the basic game mode, where players play against each other synchronously to climb a monthly ladder. Players use decks that they have constructed from their permanent card collections. It is free to play, and players earn coins for winning matches and completing quests that appear daily. Arena can be considered a secondary play mode, but is hugely important to and complements Ranked play. Here players also play synchronously with each other, but they must pay an entry fee – either coins or real money. Players make a deck as they enter the arena, choosing one of three cards at a time until they have a full deck. The rewards depend on a player’s performance, but can be generous compared to the entry cost. The balance of the two modes is important, because it provides both payers and non payers, as well as players of different skills something to do. Earlier on, players may find Ranked play easier as they learn to put together decks that rely on specific combos. Later on they may find Arena more fun as there is the challenge of putting together a deck on the fly, and all players have the same chance of getting legendary cards. Quests act as the pacing system in Hearthstone, but it is so well framed that many players don’t see it for is. Rather than restricting the number of matches that players can play in a certain time, quests limit the amount of coins that a player can earn. Players get one new quest each day, and are limited to having three in total at any one time. Players can earn small amounts of coins for winning matches in Ranked play (10 coins every 3 wins), but this is small both compared to the time it would take to play these matches (perhaps 30 minutes or more on average), as well as the coins earned from quests (40-100 per quest). As players earn most of their coins from quests, and not from playing matches, Hearthstone has no need to limit the amount of times a player can play. Players can (and do) sink hours into climbing the rankings without breaking the economy, as after the first few games their in game earnings are virtually nil. This is such a simple yet effective feature I am amazed that more F2P games have not copied it – energy systems are by far the most hated, yet standard F2P systems. I count coins as the single currency in Hearthstone and dust as the single resource. Hearthstone does not have a soft currency for everyone and a hard currency for payers. It follows therefore that it does not have items that can only be bought for hard currency. Purchasable things in the game can either be bought for either coins or real money. 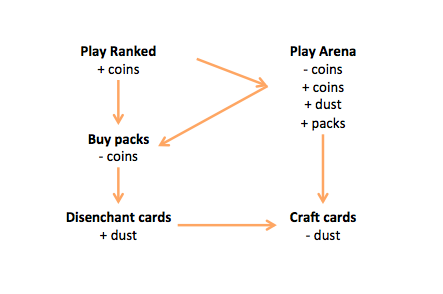 Dust is reserved exclusively for crafting specific cards. The fact that as a non payer you can get anything in the game, and you can earn coins at a reasonable rate, helps create an environment that seems fair and inviting for both payers and non payers alike. Whilst the temptation to drop real money on a bunch of packs is constant, it never feels like someone has beaten you just because they’ve spent money on the game. The nature of card rarity in Hearthstone also supports the feeling of fairness. Cards have one of four rarities: common, rare, epic and legendary. However, in contrast to many of the other mobile CCGs, cards cannot be upgraded or fused. This means that buying cards always results in a permanent addition to your collection, either directly or through the crafting system. As with all CCGs there needs to be some method of dealing with duplicate cards, to maintain the randomness of pack opening. Hearthstone only allows players to have two of each card (one of legendaries) in their deck. Duplicates beyond this can be disenchanted for Hearthstone’s main resource: dust, which in turn can be used to craft any card in Hearthstone. The conversion rate is obviously not great – cards give only 25% of their cost to craft when they are disenchanted, and making progressively rarer cards gets ever more expensive. You need to disenchant 320 common cards to craft a single legendary. But the system does mean that even if players only get duplicates through randomly opening packs they can work towards specific cards that they want to create particular decks. The fact that purchases result in permanent items that cannot be taken away from the player makes them all the more attractive. Players know that if they get a legendary card they will always have it, and its power will stay constant. Players can still spend huge amounts of money on the game, as there are so many cards to collect and the chance of getting a legendary is so low. Various Reddit posts put the cost of a Legendary at around $12-24, so with 67 legendary cards currently players could easily spend over $1,000 getting all of those alone. The cost of the epics and rare cards would be on top of that, and players can pay 4x for cards with a gold back – a purely cosmetic change. The permanence of purchases together with the overall polish in the game creates an incredibly positive buying experience. You would expect nothing less from Blizzard of course, but the pack opening sequence is spectacular, especially when compared to the drab experience in many mobile F2P games to skip a timer or add more resources. Buying something feels great, a detail that is all too often overlooked. Most mobile F2P games steer clear of including too much skill. Skill makes games more difficult to balance, as players will have a varied experience of the same content. 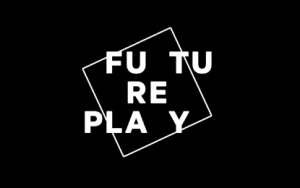 Furthermore, with highly skilled games it is difficult to give players a continuous sense of progression, as their skill level will typically plateau after an initial learning period. 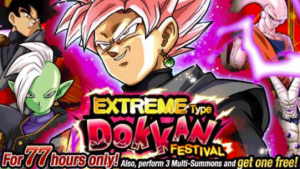 As most mobile F2P games are selling progress, they need to maintain the sense of progression that grind based games give, as ensure that players have broadly the same experience by leveling the playing field with luck. 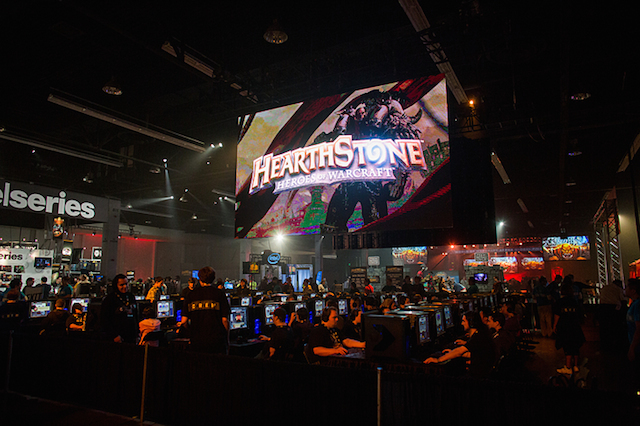 In contrast, Hearthstone has a high degree of skill – the game has an impressive number of tournaments and events, and Blizzard host a World Championship at BlizzCon that had a prize pool of $250k last year. Youtube and Twitch are awash with Hearthstone matches and the top players are starting to make their fame and fortune from the game. This is clearly a far cry from games like Clash of Clans or Game of War, where success largely depends on the amount of time (and money) players can grind into the game. That said, in Ranked play, working your way up gets more difficult the higher you go not only because you meet more skilled opponents. Any player will tell you that you need to both have the right cards to put together in a deck to create the right combos, as well as the ability to change your deck as you go. This flexibility is vital as the meta game changes as you move through the ranks. At a given time, rush decks might be unstoppable at ranks 20-15, but easy prey above rank 10. Always having the right epic and legendary cards to finish off your deck becomes essential, but you rarely need very many of them to create a good deck. The pressure to spend is in having the necessary breadth of cards, rather than a deck construct solely of very rare cards. This creates a dynamic where players do need to spend to play at the highest levels, just as League of Legend players need to practice with all the different Heroes rather than just the ones that are freely available that week. At the same time each individual card is balanced for its mana cost and players who have spent a lot of money to acquire a lot of different cards might be beaten by a player who has spent very little, but happens to have the right cards for that particular battle. Players must spend to progress in general, but matches don’t feel pay to win. Hearthstone is one of the only successful mobile games to centre on its synchronous PvP experience. Vainglory and others have tried to take this challenge on, but no one else has succeeded except another game backed by a massive desktop IP: World of Tanks Blitz. Hearthstone was in beta on PC 9 months before coming to iPad, and had half a million downloads before it even hit the App Store. This period was essential to give them the critical mass needed to match players with each other at an appropriate level. Without it players would either be facing long wait times every match they played, or getting matched against players of very different skill – either case is a potentially game breaking experience. Blizzard’s ability to drum up this level of interest in a new game is a testament to their expertise at launching new synchronous PvP games, but absolutely not a reference that other developers can hope to emulate. Without Blizzard’s existing World of Warcraft IP, installed fanbase, community management efforts and PR, the game would have faced a much harder prospect of building the community necessary for critical mass. I do not believe that we will see a synchronous PvP based game successful on mobile without a PC version any time soon. The success of Hearthstone, combined with how different it is from many other mobile F2P games makes you expect it would have a huge impact on the prevailed design trends in the industry. The pacing system in particular seems superior to the energy systems that are still prevalent in many games. However, the fact that Hearthstone was launched PC first on the back of the huge World of Warcraft brand has allowed a number of other differences that the vast majority of mobile F2P developers cannot hope to emulate.